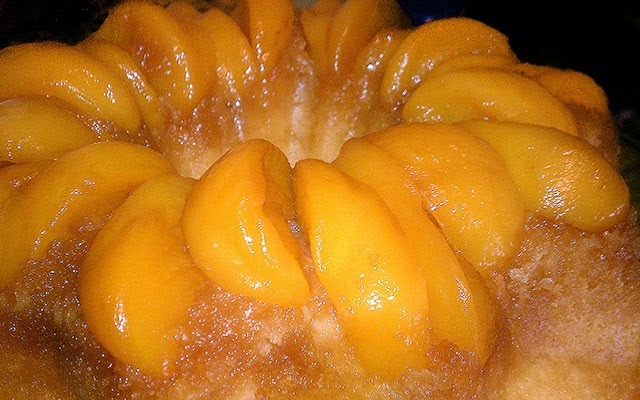 I love to eat a sweet peach...I love baking a great peach cobbler.I thought how about a peach pound cake that has all the same as a sweet peach and the great peach cobbler as well. Preheat the oven to 350 F. Spay a Bundt pan with nonstick cooking spray. in a bowl use a stand mixer, cream the butter, shortening and sugar. add the eggs one at a time, and then add the gelatin and vanilla. In a separate bowl, sift together the flour, baking powder and salt. alternately add the flour mixture and the buttermilk to the butter mixture and stir well. Stir in the peaches and pour the batter into the prepared pan. Bake until a wooden toothpick inserted into the center of cake comes out clean, 1 hour. transfer to a wire rack and let cool completely before inverting onto a serving plate. 1 big can peaches... 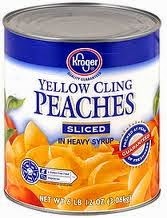 I love kroger peaches!!!! In sauce pan add butter and sugars cook until melted. adding peaches blending all together. mix water and cornstarch together and a bowl. pour in to the peach mixture until it get thicken. add lemon extract and stir well. let peach glaze cool. adding peach slices and glaze around the pound cake.